Yet another fascinating discovery from Toccata Classics, the chamber music of David Braid. Originally from North Wales (b. 1970), but now based in London, Braid has pursued composition studies at the Royal College of Music and in Krakow. He has taken a cautious approach to the wider dissemination of his music, withdrawing several early works (even one that had previously been shortlisted by the SPNM), so it seems reasonable to assume that a great deal of thought and planning has gone into this debut CD, a recital of chamber works dating from 2006 to 2011. Braid cites all sorts of influences and interests in his laudably comprehensive liner note (another Toccata trademark – read it here), but his style is unified and distinctive. Harmonic invention is his strongest suit, and the harmonic language in each of these works is engaging and adventurous, revealing a deep sensitivity to colour and texture. Typically, a work will be based on a three or four note idea, a two note melodic idea, say, over a sustained pedal. Tonal implications are deftly sidestepped, and even pitch centres seem transient and of little relevance to the music’s progression and structure. Despite the wide range of composers listed as influences, none of the composers of the Second Viennese School gets a namecheck. That’s surprising, because much of this music is reminiscent of Schoenberg at his least aggressive, or Berg at his most lyrical. But perhaps those sounds are inherited through the Messiaen and Ligeti that Braid does cite, or even his teachers in Poland. The one aspect of this music that does seem to lack invention is rhythm. Often, sections, movements or even whole works will be based on a single, continuous pulse, not as a minimalist contrivance, but more as a mere vehicle for the unfolding pitch content. In fact, the rhythmic language here is more inventive and varied than it first seems, but that invention pales through comparison with the much more elaborate and sophisticated treatment of harmony and texture. The recital begins with a Neruda setting for soprano and string quartet. Steve Reich, we are told, has commented favourably on the interaction of singer and players in this work, and I’m happy to endorse his views. Brittle, non-vibrato tones from the strings prepare the way for the singer, whose similarly elegant and uncontrived timbre is the perfect vehicle for Neruda’s economical words. The remaining works on the disc are all instrumental, and most have a reflective tone and expansive atmosphere. The one exception is the first of the Three Pieces for Solo Piano, entitled “Lyrical Toccata”. Here we are briefly transported to the world of Ligeti’s Etudes, or even Nancarrow’s Studies, with fast, scalar passages based on motifs of irregular length. The movement is only just over a minute, and more of this this sort of music would be most welcome. Not that there is anything wrong with the more reflective sounds that follow. Szymanowski is another composer whose name is notable by its absence from the liner essay, but the Invention for Violin and Piano, is very much of his world. Sonata for Quartet is scored for clarinet and piano trio, a combination that makes a lot of musical sense, especially when used as Braid does, with each player treated soloistically in his always very linear and focussed textures. Music for Dancers is a short work for piano trio, an exercise in hypothetical choreography. A little more rhythmic invention might help to make this music sound more danceable, but it certainly has the sense of drama needed for the stage. The programme ends, appropriately, with Postlude for solo piano. This music is Braid at his most reflective and Impressionistic, and the colours he draws from the piano through its simple sequence of chords are elegant indeed. The composer’s cause benefits substantially from the commitment and skill of the performers heard here. Pianist Sergei Podobedov and violinist Yuri Kalnits were apparently contacts the composer made while studying at RCM, and their advocacy has instigated many of the present works. The Tippett Quartet is already well-known for its series of fine recordings on Naxos, and its performance here is just as impressive. The Erato Trio is Kalnits’ ensemble, and they too prove to be skilled and committed proponents of this music, as do the various pianists who appear variously solo or in chamber combinations. 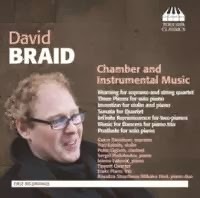 In the liner essay, Braid explains that he has been going through a chamber music phase in recent years, and this CD showcases the results. But there are clearly many other facets to this composer’s art, which it would be very interesting to hear in the future. He’s written orchestral works, and has also studied conducting, always a useful skill for orchestral composers. He also plays the guitar, an instrument far too rarely heard in contemporary classical music. His writing for the voice, as briefly demonstrated here, is clearly highly sensitive and idiomatic. Any or all of these would be most welcome inclusions on Toccata’s next David Braid release. It’s not often that music editors get the chance to be creative, but with this 1888 “variant” of Bruckner’s Eighth Symphony, William Carragan has taken the opportunity to reimagine a version that never was. He has good historical reasons for doing so however, and the portmanteau edition that he has created tells us much about the psychology behind Bruckner’s revision process. Although multiple versions and editions of this symphony exist, they can by whittled down to two for historical purposes: the original 1887 score, that found little favor with Joseph Schalk or Hermann Levi, and the 1890 revision, created on the basis of their suggestions and performed at the work’s premiere. But much evidence survives about how these changes gradually developed over the intervening three years. The Austrian National Library contains manuscripts of three of the movements, in the 1887 form but with additions and amendments penciled in in Bruckner’s own hand. The library also holds a fair copy of the Adagio, in the hand of an unnamed copyist, that is clearly transitional between the two versions. In 2004, Dermot Gault and Takanobu Kawasaki produced a fully edited version of this Adagio. Carragan has taken this as a starting point for imagining how a complete version of the score may have looked like in 1888, based on the penciled annotations in the other movements. This “variant” remains closer to the 1887 version than the 1890. The first movement still has a loud conclusion, and most of its themes have different cadential formulas to those we are used to hearing today. But there are a number of interpolated passages, some of which were retained in 1890 and some were not. The orchestration of the Adagio seems heavier than in either version, especially in the brass writing, and the harmonic progressions in the outer movements include some quite radical shifts that don’t fit easily into any other conception of the work. The development section of the first movement is particularly interesting. Here, Bruckner is moving from the logical and bold certainties of his original conception to a more psychologically nuanced discourse. But he hasn’t yet worked out how to square that more confessional style with the otherwise grandiose setting, and some of the added sections have a sense of fragility and uncertainty completely out of character with the composer’s mature style. 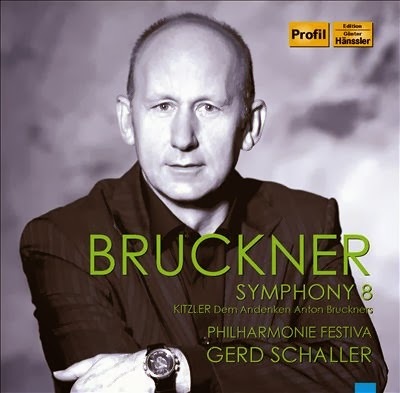 Gerd Schaller is something of a devotee of William Carragan’s Bruckner, and this release is the latest in what is shaping up to be a complete cycle of Bruckner symphonies in early or transitional versions in Carragan editions. His Philharmonia Festiva is an impressive band, a part-time ensemble made up of players from Munich’s world-class orchestras. They don’t disappoint here, with playing that is clear, driven, and committed. However, Schaller’s approach isn’t to my taste. He emphasizes clarity over grandeur at every turn, often with the result that the music is deprived of its poetry and flow. In the Adagio, for example, the lines are all expressively phrased, if within a fairly confined spectrum of rubato. But there is no daylight between each of the phrases, and the large-scale tempo relationships are rigorous to a fault. The resulting reading is seriously lacking in poise. I suspect that Schaller’s rationale is that he wants to make a documentary recording of this new “variant” and that he doesn’t want his own interpretation to get in the way. That’s laudable up to a point, but it significantly reduces musical and emotional engagement that the recording offers. That said, the conductor is to be praised to the skies for the filler he has found to round out the program. Dem Andenken Anton Bruckners is one of the very few pieces written after Bruckner’s death that is based on a conscious effort to emulate his style. The work’s history is complex but fascinating. The liner note tells us that “This work is unusual in that it seems to have been written by two composers who bore the same name.” The composers, both called Otto Kitzler, were father and son. Kitzler Snr. taught Bruckner orchestration and composition in the early 1860s, shortly after the latter’s period of study with Simon Sechter. Almost nothing at all is known about Kitzler Jnr., although the surviving piano duet score of this work suggests that it was he, rather than his father, who made the most significant contribution to it, despite there being no evidence that he was even a composer. But what a fine work it is! This memorial to Bruckner, which was first performed in 1905, takes the form of a pastiche of one of its subject’s great Adagios. Bruckner’s harmonic and contrapuntal styles are alluded to, and the scale and solemnity of the music are of apiece with his late symphonies. It doesn’t all work, however, and the main theme in particular is disappointingly trite. But it’s a major discovery, and well worth hearing. Another disappointment is that the original orchestration is not used. Schaller was only able to consult a published piano duet reduction and has orchestrated the work himself. The liner note says that the original orchestra parts were retained by the family and are now considered lost, raising the probably tenuous hope that they might one day reappear. In the mean time, Schaller’s version will have to do. As with his conducting of the Bruckner, Schaller is frustratingly modest in his ambitions here. Again, he seems paranoid about allowing his own personality to intrude into an exercise in historical reconstruction. So the orchestration is flat and unchanging throughout, worthy and competent, but unimaginative. This is all the more frustrating given the Kitzler Snr. actually taught Bruckner orchestration, and that the original orchestration of the work was clearly an integral part of its conception. Still, better this than not hearing the music at all. Gerd Schaller clearly has a very definite idea about his role in the promotion of obscure works, and of obscure versions of well-known works. His instincts as a historian and musicologist serve him well when ferreting through the archives and when collaborating with editors. But when he gets on the podium he needs to behave more like a musician and interpret the music. Only then will it return to life. This review appears in Fanfare Magazine issue 37:3. Is Max Reger really a “Forgotten Romantic,” as the title of this set describes him? Not in the German-speaking world, where organists, pianists, and conductors have continuously championed his music since his early death in 1916. Quite why he hasn’t caught on with Anglophone listeners is an enduring mystery, but Martha Thomas is to be praised for her efforts in this regard, presenting an excellent selection of highly accessible works that demonstrates a facet of the composer’s art that’s a very long way from the stereotypes of furrow-browed gloom and impenetrable counterpoint that are often associated with his name. In fact, Reger was capable of lightness, humor, and, perhaps most surprisingly of all, brevity when it came to writing to the piano. The music presented here is mostly in the form of piano miniatures, character pieces and intermezzos that draw on the traditions of Schumann and Brahms, but with a liberal sprinkling of Regerisms: unexpected harmonic shifts, sudden intemperate outbursts, and abrupt, ambiguous cadences. The program is cleverly devised to gradually draw the ear in. Disc one opens with Silhouetten, op. 53, the most elegant and flowing music in the collection. Martha Thomas performs with real authority from the first, giving the music just the right degree of levity, while always retaining a sense of poise. The op. 44 Vortragsstüke are more in the spirit of character pieces, with a great deal of variety from one movement to the next. Disc one closes with the op. 45 Intermezzi. These are more dramatic and involved, and while Thomas’s playing retains its clarity and sense of purpose, an occasional feeling of lack of emotional involvement creeps in in the more emphatic and impassioned episodes. No such concerns on the second disc though. In Reger’s short life, he managed to publish an extraordinary 147 works with opus numbers. But even this is only a fraction of his actual output. The reasons for his other music not reaching the printing presses during his lifetime and therefore not receiving opus numbers are many, but supposed lack of commercial viability tops the list in most cases. The two sets of works that appear on disc two are in this category, although it is a challenge finding any issues of reduced accessibility that might separate them from the works on disc one. Blätter und Blüten are simple but colorful works, many hovering around the one minute mark but never seeming rushed or interrupted for their brief duration. The Six Pieces that conclude the program seem to have been collected for publication (by Breitkopf & Härtel) in 1943, but musical connections between them are few. The collection opens with a Fughette (like Reger’s sonatinas and Sinfonietta, the diminutive here seems more a result of self-deprecation that diminutive musical stature). This single piece attests to another aspect of Reger’s art: his devotion to the counterpoint of Bach. It is a great neobaroque fugue, but stylistically it really doesn’t fit into this program. The rest of this final collection does though, more or less, although all of these movements are longer, and many lack the focus and musical concentration that characterize the works on the first disc: Reger’s famed megalomania finally rising to the surface? 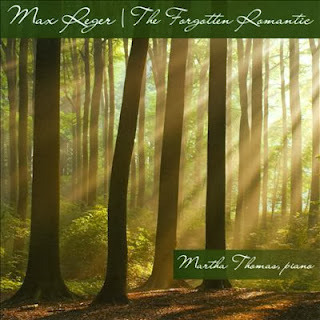 In terms of solo piano repertoire, Reger is better known for his larger-scale works, his sonatinas and his variations sets on Bach and Telemann. For those, or a selection at least, I’d recommend the recording by Wolfram Lorenzen on the Troubadisc label (TRO-CD-1438). His approach is more dramatic than Thomas’s, and the acoustic in which he is recorded is more resonant. But then, he’s playing music that requires a more dramatic approach and, arguably, a more atmospheric aural setting. Martha Thomas instead presents vignettes and does so in a delicate and considered style, with plenty of life and grace, but with a notable absence of bombast. Potential buyers concerned that that last attribute is the over-riding feature of all Reger’s music need have no fear in the case of this attractive and enjoyable album.